The Rio Indio Lodge embraces a perfect balance between comfort and adventure. Over 5 million dollars were spent in bringing to life this Ecological and Sport Fishing Resort. 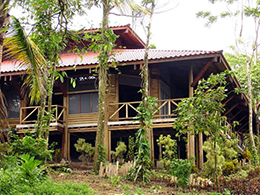 Just minutes away from the Costa Rican and Southern Nicaraguan border this lost paradise is located in the Rio Maiz National Park a vast area filled with history, virgin jungles and wildlife and some of the best fishing. Elevated walkways set in the jungle unites the surrounding nature with our cottages, main lodge, gourmet restaurant, swimming pool and bar, bringing you close to nature with all the amenities of a four star lodge. Come explore exotic Foot Paths, Birding Tours, Fly Fishing and Kayaking. Our guided tours will allow you to discover all that's hidden in this great universe of wildlife creating everlasting memories.